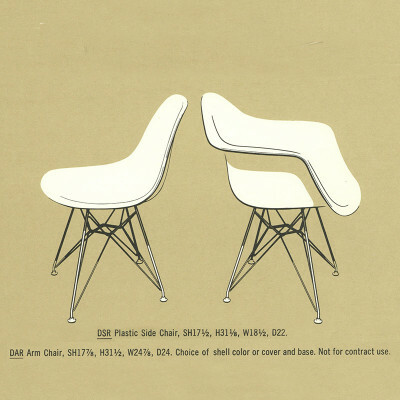 What Was the Eames DSR side chair? Part of the Eames plastic chair series, the abbreviated Eames DSR Chair stands for Dining (D) height, Side (S) chair, on Rod (R) base. 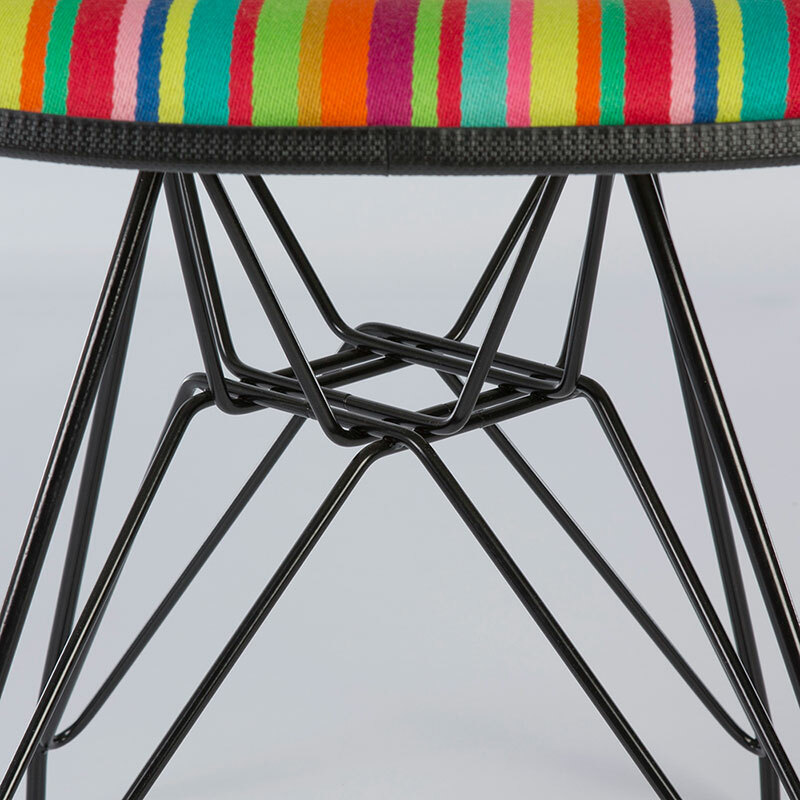 The eye-catching design was part of the first series of side chairs developed from 1951 and due to its fabulous construction would soon be labelled the 'Eiffel' chair, for it's resemblance to the famous Parisian tower. The base design was a narrower adaptation of its sister arm chair, the Eames DAR which had earlier been developed in 1950 with the initial release of the first fiberglass Arm chairs. 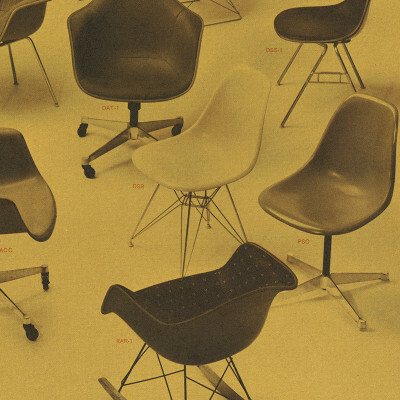 With Herman Miller focusing more and more toward the workplace furniture market, the DSR was discontinued in 1967 and all fiberglass chairs were de-commissioned in 1989 when both a lack of interest and a new wave of eco-friendly mindfulness brought its production to a halt. 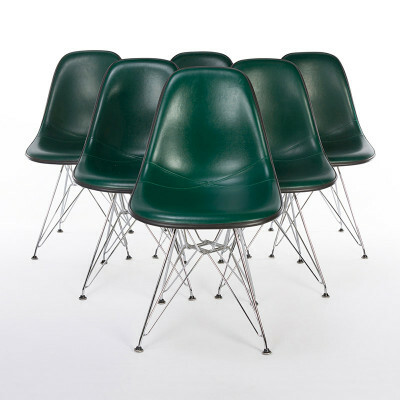 It reappeared however with the 2001 new release of the plastic side chairs sporting the less favorable but more modern ‘polypropylene’ tops. To every purist’s joy, Herman Miller began remaking the fiberglass version of the chair in 2014 albeit with a more conservative palette of colors. Despite the notoriety that the base has today, it was certainly not as popular a choice or as big a seller as the DSW, DSX or DSS based versions at the time. 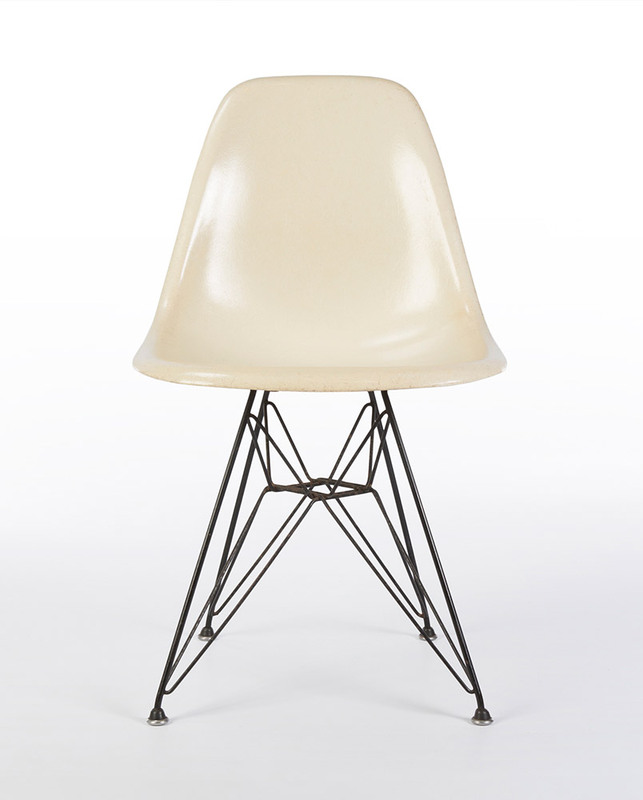 It was however an always present option and was available in zinc, black or (later years) white powder coating. The DSR-1 was an additional early version which included a detachable hopsack upholstery cover and later versions had upholstery permanently fixed. The side chairs were only originally released in 3 shell colors until they quickly gathered traction with the buying public and were produced in multiple factories across the US. 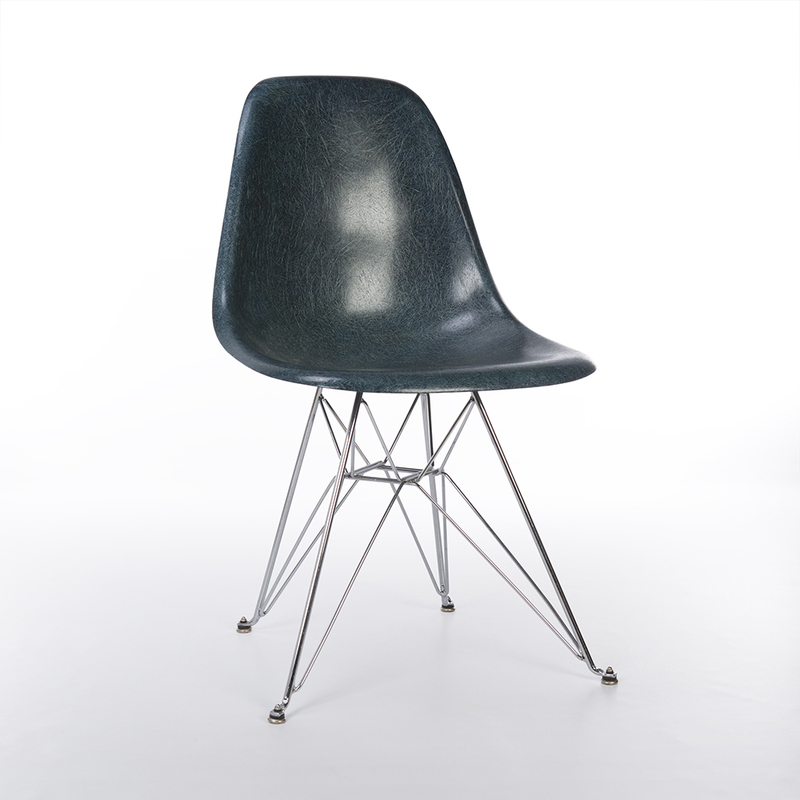 Since 2010, the Eames DSR Eiffel Chair has been released with a series of molded plywood tops to the same shape and dimensions of the original. 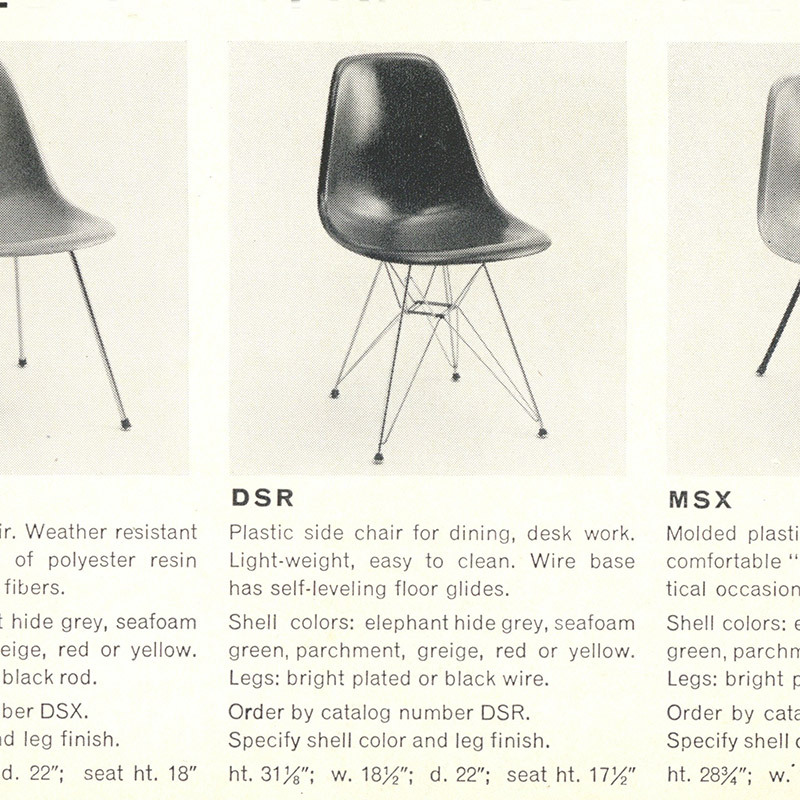 What are the original sizes of the Eames DSR Side Chair? 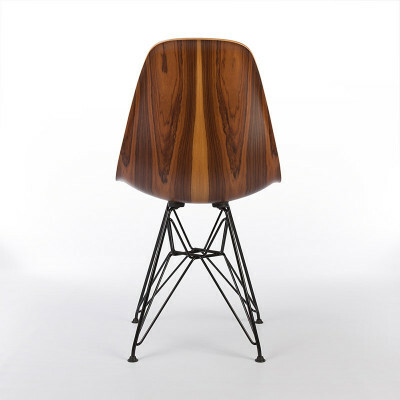 What materials were used to make the Eames DSR Side Chair? The very first DSR releases had 'splayed' feet. The construction of these turned out to be fiddly and more expensive because of the extra section and hexagonal nut. The replacement second generation base would arrive within the first 6 months. The second release of the base changed the feet to a combination of rubber and aluminium in a 'boot'. The boot pressed onto a welded ball on the end of the leg frame as opposed to the splayed outer foot of the first version. 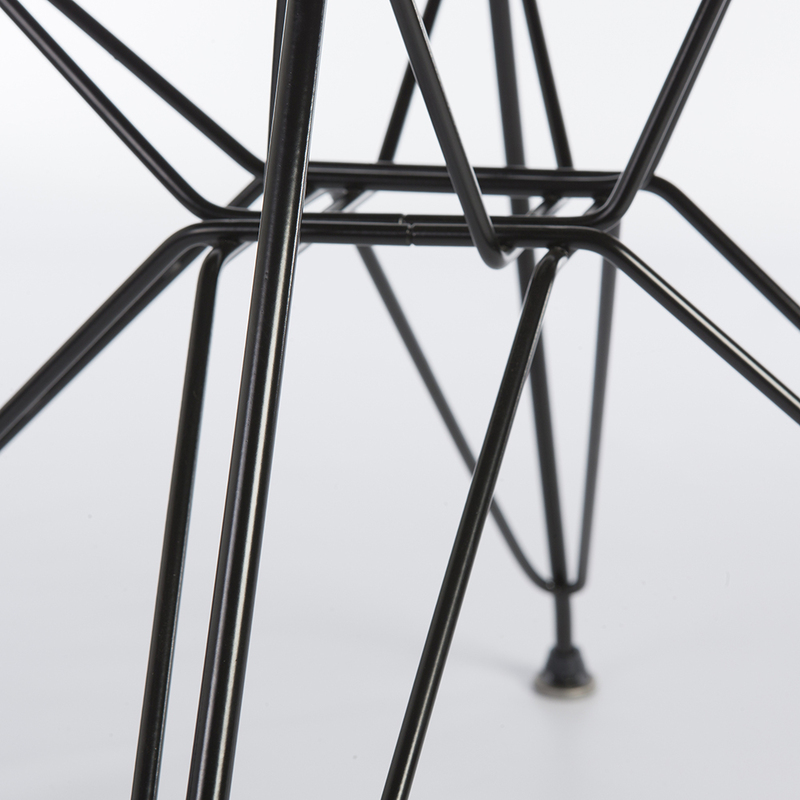 The post 2001 re-release of the Eiffel DSR base used a black plastic clip-on glide foot which, as with the second generation base, was pushed onto a ball at the end of each rod leg. This base is more synonymous with the polypropylene era but is being used on the new fiber releases post 2014. 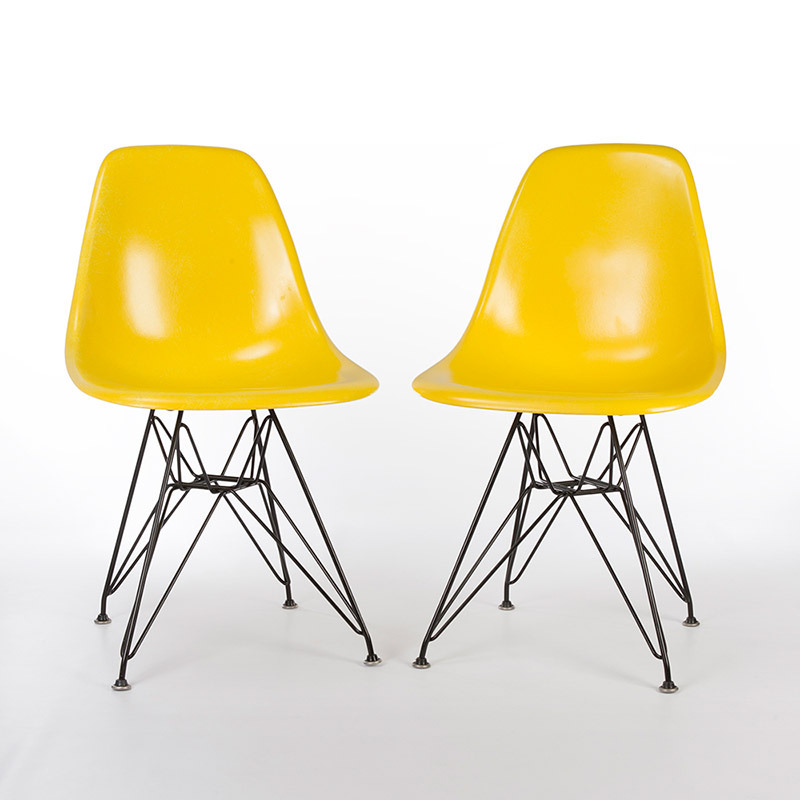 DSR shell labels and stamps span the generations of fiberglass side chairs over the years and can help determine the top’s authenticity. 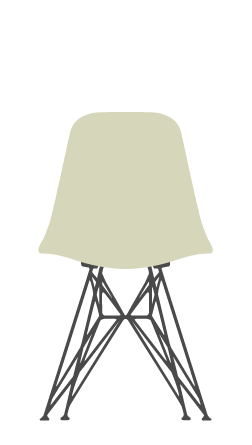 Eiffel bases have no makers mark, Check for ageing and that vintage bases are zinc plated or a dull black finish. Reproductions tend to have bright shiny chrome and only later was white introduced. Genuine bases should usually fit very well, so poor fitting is a clue of non-authenticity. You can also check shock mounts to see if there are imprints from other base types. 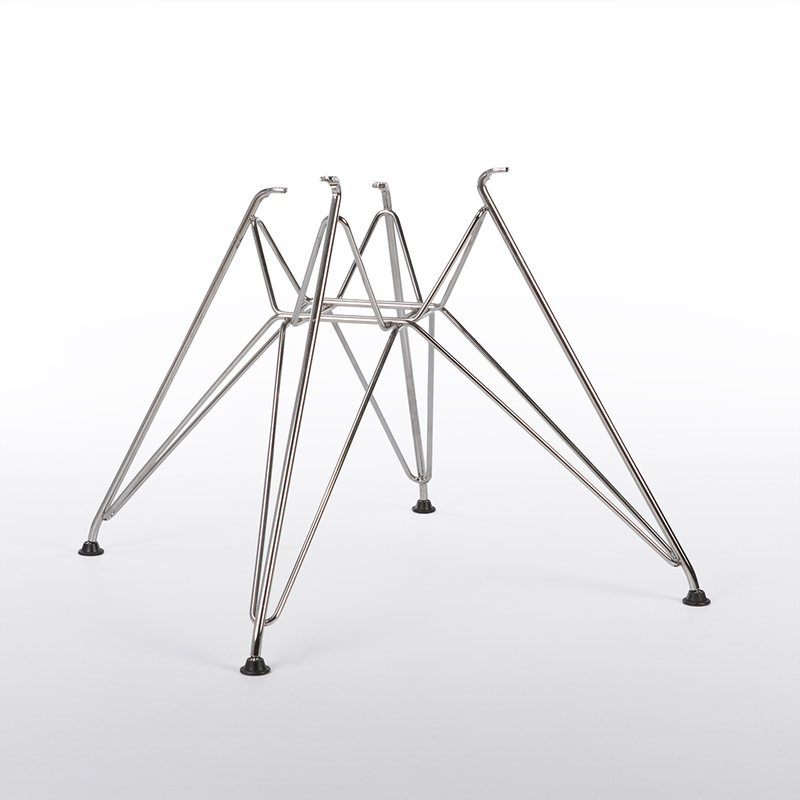 Eiffel bases are one of the most copied since the mid 2000's, including all types of generation feet. See our authenticity of shells section for further help. Always check fiber shells for cracks or dents, especially around the edges. Early versions with original removable upholstery pads intact are highly desirable. 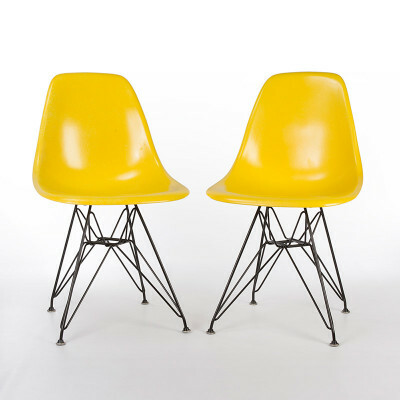 Shell prices are generally based on the desirability or rarity of the color of the fiberglass or pattern design of the upholstery. Check the base for intact welds, that it fits the shell well and that all the feet are present. 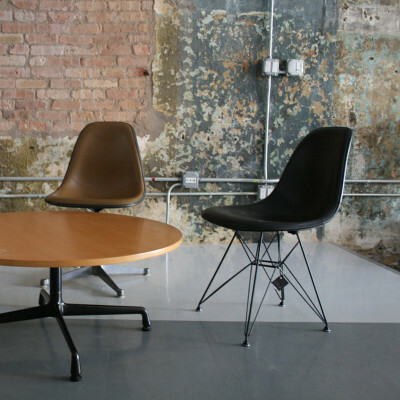 Upholstery with defects, punctures or lifting from seat reduce the overall value.